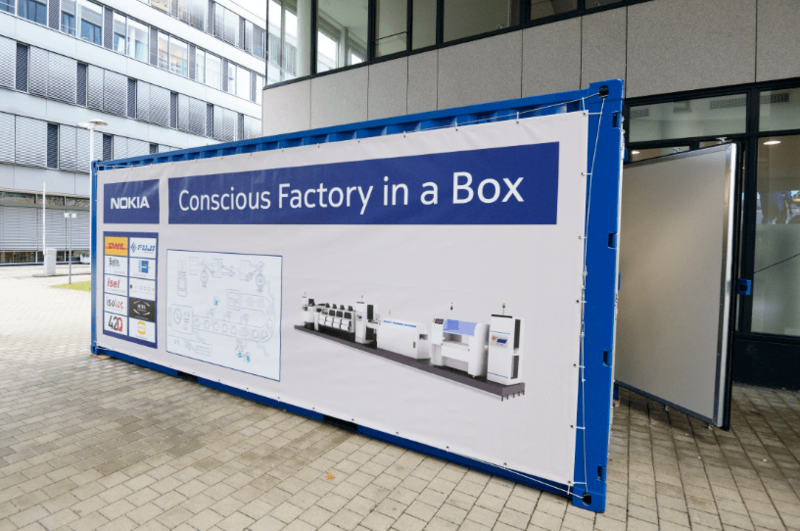 Nokia has showcased the second generation of its modular factory concept, Factory in a Box, at Hannover Messe, the trade show for industrial technology held annualy in Hannover, Germany. First introduced in Finland by a Nokia-led group of 12 electronics industry players in February 2018, the concept is about building a manufacturing line using cargo containers that can be moved to different locations as the need arises. The group said at the launch last year that this kind of “collaboration" was driven by the "expected changes in manufacturing sparked by Industry 4.0, including cloud-based solutions, robotics, and new electronic manufacturing IoT solutions." Among the potential use cases cited include disaster recovery, new product introduction with crucial time to market element, and building in specific locations as needed. At the demo in Hannover early this month, Nokia's second generation factory container now includes Nokia Worldwide IoT Network Grid (WING) for global IoT connectivity and the Nokia Digital Automation Cloud for reliable and secure connectivity. Nokia said WING gives mobile network operators the ability to collect this IoT data from all parts of the supply chain, no matter where the devices are located. The Nokia Digital Automation Cloud, on the other hand, is optimized for industrial needs and it can host time-sensitive applications and IoT stacks that require low latency. New partners have also been added to the ecosystem, including augmented reality and 3D printing technology to improve production workflow. Moreover, the modular production line can now be deployed anywhere in the world and set up within hours, Nokia said. "We could tell from the positive feedback we received on the Factory in a Box last year that there is a lot of potential for this concept in the manufacturing industry," said Grant Marshall, VP Supply Network & Engineering at Nokia.